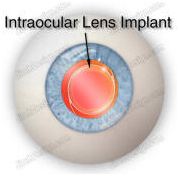 IOL-Intra-Ocular Lens Implant India offers information on IOL-Intra-Ocular Lens Implant in India, IOL-Intra-Ocular Lens Implant cost India, IOL-Intra-Ocular Lens Implant hospital in India, Delhi, Mumbai, Chennai, Hyderabad & Bangalore, IOL-Intra-Ocular Lens Implant Surgeon in India. A cataract operation involves removing the natural cloudy lens from the eye. Without a lens within it the eye is widely out of focus and remains legally blind. The best remedy for this is to insert an artificial lens into the eye. This is now a standard part of cataract surgery, though it has not always been so. 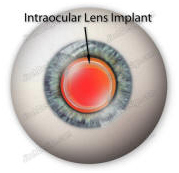 This artificial lens is called "The Intra Ocular Lens Implant". Surgeons often refer to it as the IOL (Intra Ocular Lens). If a lens implant is not used the eye must be brought into focus with either a spectacle lens or contact lens. Each of these has disadvantages. A spectacle lens will be thick, heavy and restrict the field of vision. A contact lens has to be looked after and taken on and off the eye. An intra ocular lens once inserted can be forgotten about by the patient and restores the eye to the most nearly natural state. The history of intra ocular lens implants. Types of intra ocular lens implants . Intra ocular lens implant power. Innovations & possible future developments with intra ocular lens implants. A cataract operation involves removing the natural lens from the eye. In order to restore focused vision to the eye an artificial plastic lens is placed into the eye after the cataract has been removed. This is now a standard part of cataract surgery. During the second world war some aircrew suffered injuries to the eyes from shattered pilot and turret canopies. These structures were made of perspex (polymethyl methacrylate or PMMA) and in some cases tiny fragments penetrated and remained within the eye. It was then observed that this material caused very little reaction within the eye and remained stable over many years. It was deduced that perspex would be a good material from which to make intra ocular lens implants. It remained the principle material used until the mid 1990's and is only now being superseded by more modern plastics. The British ophthalmologist Harold Ridley is credited as the first eye surgeon to place an artificial lens into the eye following removal of a cataract. This was around 1949 - 1950. At the time he was considered to be a bit of a maverick by his colleagues. In the face of opposition from the rest of the medical profession he initially abandoned the technique though continued to pursue the concept with lens manufacturers. In 2000, aged 93 and just before his death, he was knighted for his pioneering work. It was not until the late 1970's and early 1980's that intra ocular lenses gained widespread popularity and acceptance amongst eye surgeons within the UK. The idea of inserting a lens into the eye had to wait until surgical techniques had developed to the point where it was safe and possible to do so. There have been two particularly important factors in this. Firstly the development of gel like substances (called viscoelastics) which can be placed within the eye during surgery to create space and protect the delicate internal structures of the eye. These substances allow the lens implant to be safely manipulated into position within the eye. The second factor was the development of surgical techniques which preserve a platform within the eye onto or into which a lens implant can be securely positioned. The best location for an intra ocular lens implant is behind the pupil, i.e. as near as possible to the position of the natural lens of the eye. The move away from intra capsular cataract surgery to the extracapsular technique in the 1980's made it possible to support a lens implant behind the pupil. Phacoemulsification cataract surgery popularised in the 1990's now means that the lens implant can be placed within the pocket (the so called capsular bag) of the natural lens. All intra ocular lens implants have two parts. The central part is the focusing or true lens component of the device. This is shaped like a thin round disc and is usually between 5 and 7 mms in diameter. This part of the lens is called the “optic”. From the edge of this optic extend limbs, called “haptics”. These support the lens in position within the eye and ideally keep the optic centred on the line of vision. Most lens designs have two haptics extending from the optic in opposite directions. There are a few lenses on the market with more than two haptics. The lens as a whole may be made from a single piece of plastic. It is then referred to as a one piece lens. Alternatively the optic and the supporting haptics may be manufactured separately and then fused together. If the lens has two supporting haptic limbs bonded to the central optic it is referred to as a three piece lens. Different lens designs may have differently shaped haptics. These may be simple 'C' or 'J' shaped loops or have more complex sinuous forms. In one design, known as the plate haptic lens, the central lens optic is supported by two paddle shaped limbs and the whole lens has a rectangular form. Intra ocular lenses are made from clinical grade plastics. These materials need to be chemically stable and inert within the eye. They must not cause any irritation or chemically induced damage to the tissues of the eye. In other words they must be safe and reliable. They must last a lifetime. The first plastic used to make an intra ocular lens was perspex (polymethyl methacrylate); also known as PMMA. It is a rigid material and the same substance from which traditional hard contact lenses are made. Many millions of such lenses have been implanted. One company has devised a means of bonding a substance called 'heparin' to the surface of lenses made from this material. This has the effect of making them 'non stick' and ideal for use in eyes with a history of inflammation or in patients with diabetes. In the UK PMMA lens implants are now going out of use and have been replaced by lens types made from more modern plastics. These materials include silicone and a variety of acrylics. These substances are pliable and lenses can be manufactured from them that can be folded. Lens implants made from PMMA (described above) are rigid. The 'optic', the main focusing part of the lens, is inflexible. It cannot be bent or folded. This part of the lens is usually between 5 and 7 mms in diameter. The incision in the eye must therefore be at least this big in order to allow the lens to be put into the eye. If the incision is made in the form of a slit like tunnel it may be self sealing and not require a suture. However the larger the incision the more likely it is that a suture will be required in order to leave the eye in a sealed and secure state at the end of the operation. Newer silicone and acrylic materials are pliable. Lenses can be made from them that can be folded. This means that the entire cataract procedure can be performed through a small incision of around 3mms or less. The lens implant is folded and introduced into the eye either with special forceps or an injection device. Once within the eye the lens is released and gently unfolds to its full size. It is then manoeuvred into position. Only a very slight enlargement of the incision is necessary to permit the insertion of a foldable lens implant. In the vast majority of cases the incision does not then require a suture. This makes the surgery quicker, simpler and the focus of the eye settles more rapidly post-operatively. 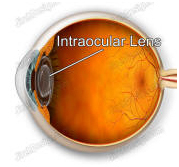 An intra ocular lens may be placed in the space between the cornea and the iris, be attached to the iris or be placed behind the iris and pupil. Nowadays lens implants are usually placed behind the iris and pupil. The fluid filled space between the cornea and the iris is called the anterior chamber. Lens implants designed to be positioned here are therefore known as anterior chamber intra ocular lens implants (A/C IOL’s). These implants are supported in position by S-shaped haptics (supporting limbs) that rest in the periphery of the anterior chamber where the root of the iris and the dome of the cornea meet. This is called the anterior chamber angle and this type of lens implant is therefore said to be 'angle supported'. When using an anterior chamber lens implant it is usually necessary to make a small hole in the periphery of the iris. This is called a peripheral iridotomy (or PI). This is because the optic of the lens, which sits immediately in front of the pupil, may obstruct the flow of aqueous fluid through the pupil. This could cause a rise in the fluid pressure within the eye (glaucoma). The iridotomy prevents this from happening. An intra ocular lens implant may be clipped or hooked to the iris. This type of lens was abandoned in the early 1980’s due to an unacceptably high rate of complications. A newer design has more recently been devised but in the UK it is at present rarely used in the context of cataract surgery. With current techniques of cataract surgery the intra ocular lens implant is usually placed behind the iris. The “optic” (the true focusing part of the lens implant) sits just behind the pupil. This is very close to the position of the natural lens of the eye (which has been removed). The small space behind the iris is called the posterior chamber. Lenses designed for implantation into this space are therefore called posterior chamber intra ocular lens implants. Eye surgeons refer to them as P/C IOL's. One of the advantages of phacoemulsification (and extra capsular cataract surgery) is that part of the lens capsule is preserved. This capsule is a thin membrane like structure that surrounds the natural lens of the eye. With these particular surgical techniques the opaque natural lens (the cataract) is removed from within the capsule. The capsule remains as an empty pocket. It can then be used to support and fixate a posterior chamber lens implant. Without this support the lens implant would fall into the vitreous gel that fills the main cavity of the eye and would end up at the back of the eye. The posterior chamber lens implant can either be placed onto the remaining capsule or actually slipped into the capsular pocket. Placing the implant onto the capsule is rather like resting the lens onto a mini trampoline. The supporting legs (haptics) of the lens implant rest in the cul-de-sac between the back of the iris and the ciliary body. This recess is called the 'ciliary sulcus'. Posterior chamber lens implants resting on the surface of the capsule are therefore said to be sulcus fixated, i.e. held in position by haptics resting in the ciliary sulcus. Alternatively the lens implant may be placed inside the capsular pocket. Eye surgeons call this the 'capsular bag'. A lens held in place in this position is said to be 'in the bag' or capsular bag fixated. This is the probably the best place for a lens implant as it is the exact position of the natural lens of the eye. Implants that correct the optical aberrations of the eye. There has been much discussion of late as to the best shape for the edge of a posterior chamber intra ocular lens implant. The current consensus is that the back edge of the optic (the main focusing part) of the lens should be square and that the front edge should be rounded. It is thought that a square back edge will help prevent the development of posterior capsule opacity. The lens implant rests on the posterior capsule. Immediately after surgery this membrane like structure is clear. In some eyes as time goes by it becomes hazy or opaque and vision worsens. This opacification is partly due to the proliferation of cells on the surface of the capsule. If the lens implant has a square back edge which abuts into the surface of the capsule this may prevent cells from proliferating across the capsule beneath the lens. This would then help to keep the capsule clear in the line of vision. A rounded front edge is thought to reduce internal reflections and stray light within the eye. Many lens implant manufacturers have now adopted these edge features. In youth the eye has the ability to naturally adjust its focus. As well as having clearly focused distance vision the eye is able to re-focus for near vision. This ability, called accommodation, is gradually lost with ageing. This is why most people need reading or near vision spectacles by mid 40's. This adjustment of focus is produced by a small muscle inside the eye which alters the shape of the natural lens of the eye. As the years pass the natural lens becomes less pliable until by age 60 all focus adjustment has been lost. Similarly after a conventional cataract operation the eye has a fixed focus. Traditional lens implants have only a single focus power which cannot be adjusted by the eye. If after cataract surgery the eye is in focus for distance vision spectacles will be required for near vision. Theoretically one solution to this is to use a lens implant with both distance and near focus; rather like bifocal spectacles. Multifocal lens implants are now clinically available but in most situations the patient must be prepared to accept some degree of blur. If the distance portion is in focus on the retina there will be a ghost near focus and vice versa. These lenses will only enable the patient to be free of spectacles if there is no significant astigmatism and the distance and near lens implant powers are appropriate for the individual eye. As explained above in the section on multifocal implants after a conventional cataract operation the eye has no ability to adjust its own focus. The ultimate dream, or the holy grail, of cataract surgery is to produce a lens implant with an adjustable focus. If this were possible then not only would sight be restored from removal of the cataract but the eye would also be returned to its youthful freedom from reading spectacles. Some lenses have now been designed which may be able to do this. They are though currently experimental and, at the time of writing, their long term success in clinical practice has not yet been proven. The theory is that on attempting to focus for near vision the little focusing muscle within the eye (called the ciliary muscle) causes the lens implant to move forwards slightly. If the lens sits a little further forward within the eye its power is in effect slightly increased. 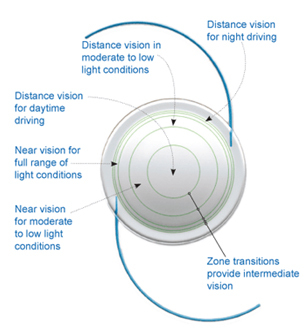 The main focusing part of a conventional lens implant is optically very simple. It is usually biconvex, i.e. both the front and back surfaces have a raised curvature. This curvature is part of the surface of a sphere, i.e. it is like the curvature on a soccer ball. A lens of this design will correct the main focus error of the eye. However it does not correct the other optical aberrations or imperfection of the eye (e.g. spherical aberration). These aberrations cause vision to be slightly degraded especially when the pupil is large. The natural lens of the eye is shaped in such a way that some of these aberrations are neutralised. In other words a traditional style of lens implant is not as good as a clear natural lens at achieving the best possible focus and clarity of vision. Devices developed for use in laser refractive surgery are able to measure the optical aberrations of the eye. These devices are called 'wavefront aberrometers'. They shine a low power laser beam into the eye. This is reflected from the back of the eye. From an analysis of how much the beam is defocused by its passage through the eye it is possible to calculate the main aberrations of the eye. The laser treatment can then be given to correct not just the short or long-sightedness but may also re-shape the cornea to correct the optical aberrations of the eye. This technology could be applied to cataract surgery and the design of lens implants. If the aberrations of an individual eye were known the curvatures on either the front or back surface of the lens implant could be manufactured so as to correct these aberrations, as well as the main focus error of the eye. In other words the lens implant could be optically “made to measure” for each individual eye. Alternatively knowledge of the average aberrations of the eye at a given age could be used to produce an 'off the peg' aberration correcting lens implant. Such a lens is now commercially available. An alternative way to perfect the focus of a lens implant to the individual requirements of an eye is to adjust the focus of the lens after it has been placed into the eye, i.e. to do so post-operatively. A lens material has now been produced whose shape can be adjusted using a ultra violet light. A lens of approximately the correct dimensions is implanted and the eye is allowed to recover from the operation. The focus and aberrations of the eye are then determined. The lens is exposed to a specific wavelength of light in such a way that its shape is altered slightly to perfect the focus of the eye. This can be done more than once if necessary. When the best focus has been achieved the lens is exposed to a different light which fixes or sets the lens and keeps the desired shape. Phakic IOL anterior chamber, intraocular lens implant. Phakic IOL posterior chamber, sulcus, implant. Soft, foldable Intraocular plate lens implant illustration. Phakic IOL for posterior chamber, sulcus. Soft, foldable intraocular plate lens, IOL. IOL, intraocular lens implant illustration. 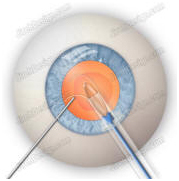 Intraocular lens implantation surgical illustration. Intraocular lens implant, IOL, cross-section view.